I am still busy using stuff up and trying to do something with all the UFO’s (unfinished objects) lying around the studio. This piece was started in September 2017 for one of the Quarterly Challenges. You can see the post here on how I created the piece thus far. Until I reread my post, I had forgotten what a pain this was when I was making it. I’m sure that’s why it got put away and left for dead. Here’s the piece before I did anything too it. It’s OK, but I thought it might be improved with some free motion machine stitching. I worked on it in the mornings before work for 10-15 minutes at a time. I have the machine all set up and ready to go so I can sit down and start working for short time periods. I decided to fill the inside shapes with dense stitching. I used a light lavender thread in Sulky 30 weight cotton. I wanted to have a contrast between the dark design and the thread but still be able to see the color of the silk underneath. I completed all the stitching inside the design and it really helped the design to pop out from the felt. Then I added a couple of circles around the design. I used a bowl to mark around with a dressmakers pencil so I had a line to follow. The pencil just wiped away after stitching. Then I cut the circle out around the outside stitched line. I even like the back side too. Now I have to decide how to finish it and hang it. I have a 12″ x 12″ canvas that I could cover with fabric or paint and then attach the circle. The photo above shows a possible fabric choice. I only have a small piece of it so I would have to dye more. Perhaps slightly darker than this background? If I painted it, I considered making a partial stencil to decorate the corners of the square with a similar design. I guess I could try that and if it didn’t work, I could always cover it up with fabric. What do you think? How would you finish it? Hubby suggested using it as a hot mat but the silk on top wouldn’t hold up very well. Plus I have absolutely no pink in my house so it doesn’t exactly go with anything. 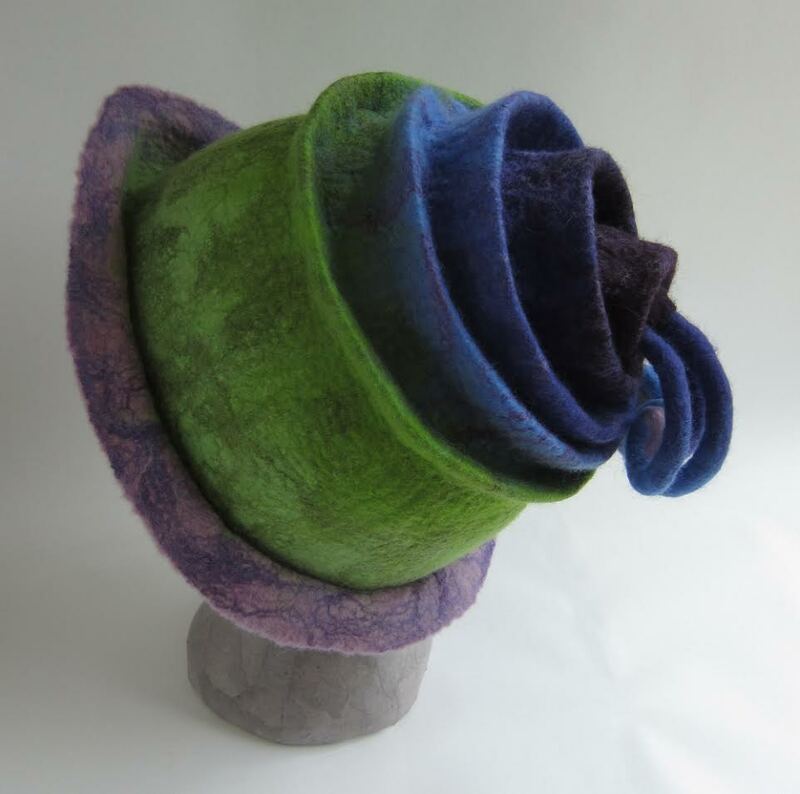 Updating my post to remind everyone that Terri Berry’s online concertina hat making class registration opens on February 7th. Go here for more information. 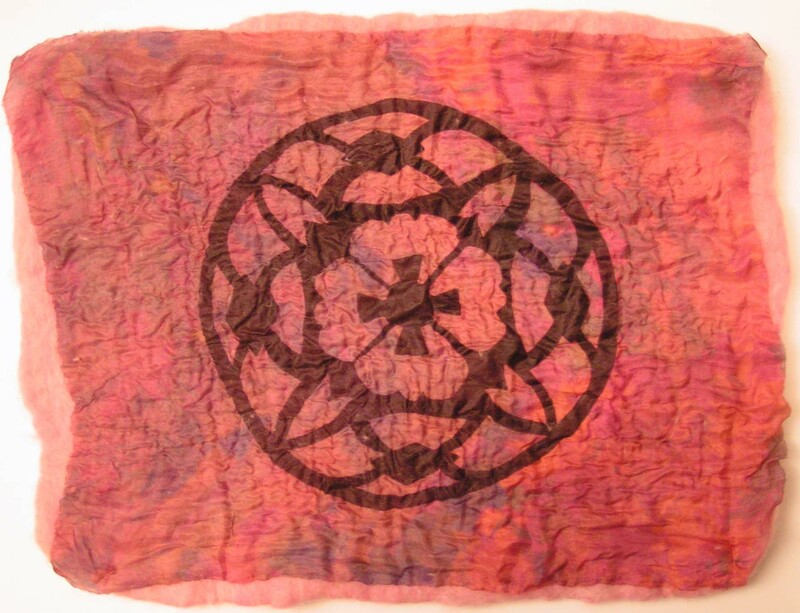 This entry was posted in Finishing/Framing, free motion embroidery, Nuno Felting, Surface Design and tagged experimenting with nuno felting, Japanese Edo Art period, screen printed felt. Bookmark the permalink. Wow! This is absolutely gorgeous – front and bacķ! I would prefer it on a solid colour such as the one you have so that it does not detract from the pièce itself. Thanks Lise! Yes, a solid color is probably best. I suggest putting it on a Indigo/royal blue. So that the pink really pops. Carlene, thanks for the suggestion! It turned out great on both sides. Personally I liked the Nuno, but the stitching added a different texture. As for the backing, is there a color In your house it would compliment? A purple or blue may work well and accent those highlight colors in the Nuno. A hot mat? No! It’s for admiring not for using. The stitching has completed it beautifully. I know, what was he thinking? Thanks Lyn! 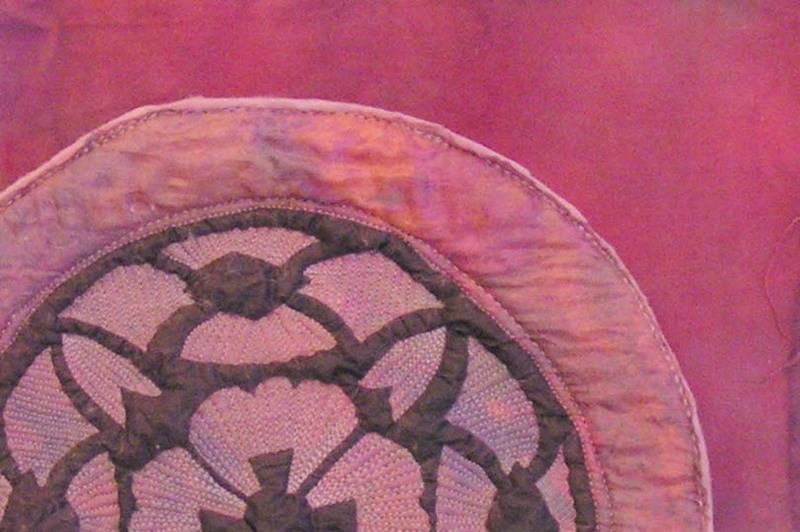 Beautiful stitching – definitely a piece for show rather than for use! Maybe a darker background so that the piece stands out? Thanks Kim, yes, darker is probably better than lighter. The stitching really brings it out. A hot pad indeed. What goes on in men’s minds. I like either a darker shade of the red as you had or a deep green I think. maybe play with different backgrounds on the computer. Thanks Ann, yes men are a puzzle at times or perhaps all the time 🙂 That’s a good idea to play with colors on the computer. I’ll see if I can figure out how to do that. You really did transform that piece, it is gorgeous, Ruth, I’m sure someone won’t be able to live without it whichever way you decide to finish / hang it. I remember you feeling frustrated with this piece in your old post but the stitching has totally elevated it. I like both sides so mounting it would be a dilemma for me. Does it have to be on a solid background? Could you use a wooden embroidery hoop (darkened to give you the contrast you want) and design how it is attached to give it’s future lucky owner the option of back or front? Thanks Antje, I considered mounting so both sides could be viewed. The embroidery hoop idea is good. Would have to work out the logistics for it.